Pork is a great barbecued. We usually just marinade it, but this recipe goes a step further by wrapping the marinades pieces in foil and adding potatoes and chutney. I don’t think it really matters which cut of pork you use and if you don’t want to barbecue you can always cook it in the oven. 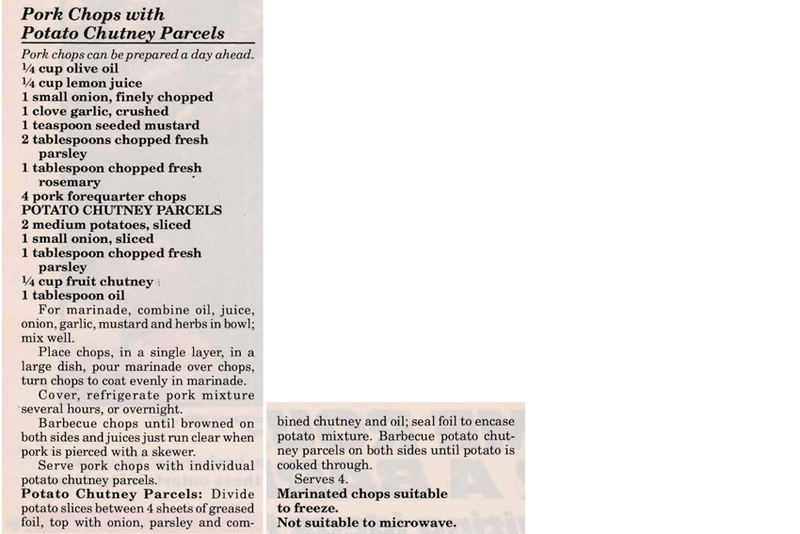 This entry was posted in All Recipes, Main Dishes, Pork and tagged 1990s, barbecued pork, chutney, pork chops, pork chops with potato chutney parcels, pork parcels, potatoes by bebsrecipes. Bookmark the permalink.